Following in his father's footsteps, Pepe had a noteworthy career, culminating with him becoming Sighthound of the Year in 1988 and Afghan of the Year in 1989. In addition, Pepe placed in the top 5 of the Afghan of the Year competition during the years 1984-1991. Although he spent the first few years of his life in his father's shadow, Pepe went on to win 6 Specialty Best of Breeds, over 30 all-breed Best of Breeds and several group and Best In Show placements. Like Wes, Pepe also proved his value as a stud with 17 champions from 6 litters. Pepe's son, Ch. 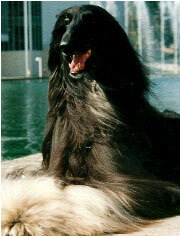 Izmar Tragband Finnegan, went on to become a top stud dog in the UK. 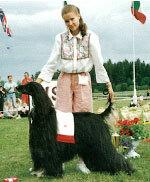 Pepe was owned by Bodil & Maija Arlander.